Crooks won’t get away with their bad deeds now that you’re on the case! With a full forensic kit and loads of cool tools to track down suspects, now it’s YOUR turn to lay down the law. Be first to the scene and first to solve the crime with your investigator briefcase to hand! 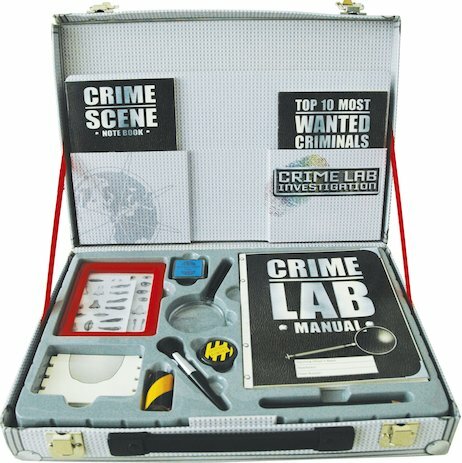 Crime-busting kit contents: Investigator briefcase, magnifying glass, fingerprint kit, photo-fit kit, Crime Lab manual, Crime Scene book, Most Wanted Criminals book and a pencil. I had this for my 11th Birthday and really enjoyed it. The only thing is that once the fingerprint stuff and other bits are used up, the kit can’t really be used anymore, but it is good fun!! how do you buy it???? I want to get this book becuce i have a lot of agent stuff. it is sooo!!!!!!!! good and my mum dose not let me buy this i want to be a spy!!!!!!!!!!!! !